Buna dimi.Normal ca Madhu spune ca-l iubeste doar pe el de teama ca nebunu sa nu-si faca ceva mai rau decat o simpla taietura la mana.Nu e normal la cap. Who is the real rockstar? Who out of Sanaya, Krystle, Drashti, Sonarika and Jennifer is the most beautiful actress of TV at present? TRPs for Week 14, 2013! Ratingul este in scadere se pare la serialele de pe colors tv. Madhu este pe primul loc de doua saptamani dintre serialele ce se difuzeaza pe colors. RK of 'Madhubala' clarifies Rumours about quitting the show.! "I just Love u Guys and dont worry Im not quitting MadhuBala at all n m very much there n i"ll keep entertaining u the same way n i work u know i will work harder and harder to do a better job and to give u more and more of entertainment"
Tellychakkar.com is very much aware of the fact that fans would love to talk to their favourite TV actors over phone. Yes, it would indeed mean a moment of dream come true. However, we can’t really provide phone numbers of your favourite stars, but can certainly take all of you a little closer to them but sharing their caller tunes. 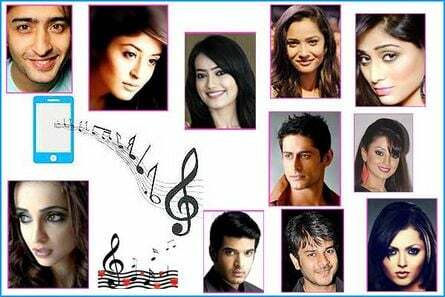 Yes, we all love caller tunes and so do television actors. So let’s see what one can hear on calling Sanaya Irani, Vivian Dsena, Gurmeet Choudhary and other big names of small screen. Next is bubbly and peppy Drashti Dhami, who is currently seen as Madhu in Colors’ Madhubala and her caller tune is ‘That’s my name’ sung by Akcent and Edward Maya. Like her beautiful face she also likes songs which have beautiful lyrics and tunes.